We hear there’s some big event kicking off in London this Friday (no, not TYPO London – but you can win a conference ticket for October 19-20). Getting in the spirit of international competition, we’re holding a coinciding event – The 2012 Fontlympics — a celebration of fonts and their many feats! Catch a preview in last week’s newsletter and make sure to subscribe to future issues to catch all of the events. Watch our Twitter, Facebook, and Pinterest as we spotlight our typographic competitors over the 16 days of the games. And you will not want to miss staying tuned to the blog for a special interactive competition. That’s right, beginning Monday, July 30 and ending Friday, August 10 the FontShop blog will host the Fontlympic Decathlon, pitting five typefaces against each other throughout 10 events. Vote each weekday for the best face in each event and help us determine the best all-around typeface. If you’re like me and need a bit of inspiration to get your creativity going, then FontShop has great archives you should check out. Our Gallery has a curated collection of typefaces being used in the real world and is categorized based on the type of projects those images fall into. For example, you can choose to view all the images for packaging if you wanted. 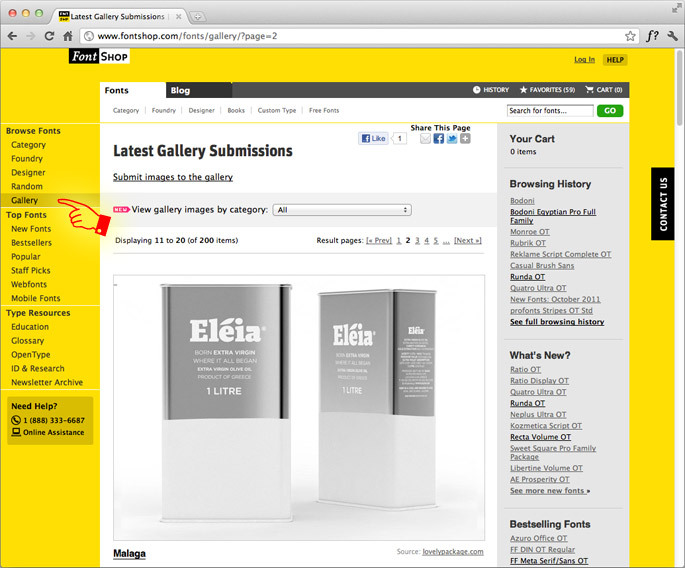 You can even submit images to our gallery using the bookmarklet tool. If you ever missed a newsletter from FontShop or accidentally deleted one you were saving, don’t fret! 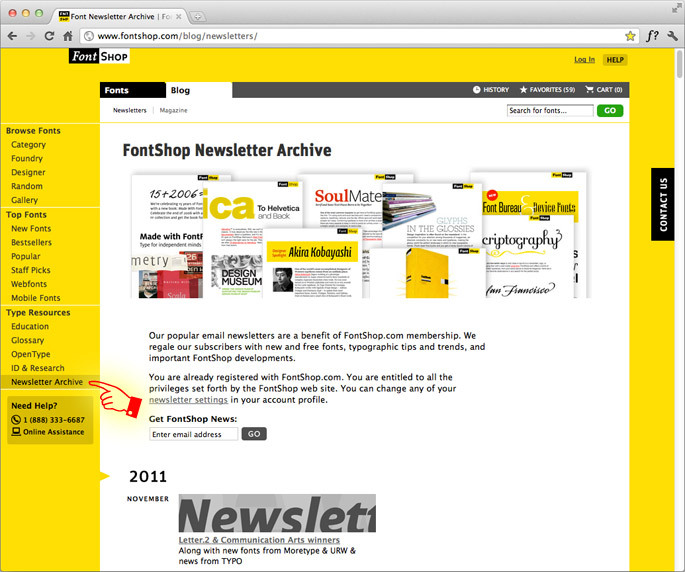 We’ve stored all of our previous FontShop Newsletters here. Sign up to receive them, if you haven’t already. You don’t want to miss our Best of 2011 (and don’t forget to submit your suggestions for the chance to win a FontBook app for iPad). Our education page is a favorite resource for students and educators. It provides typographic tips available in PDFs that you can download for free, which is nice when you need to brush up on terms. Hope you enjoy our archives. Are we missing anything that may be useful to you? Let us know in the comments. 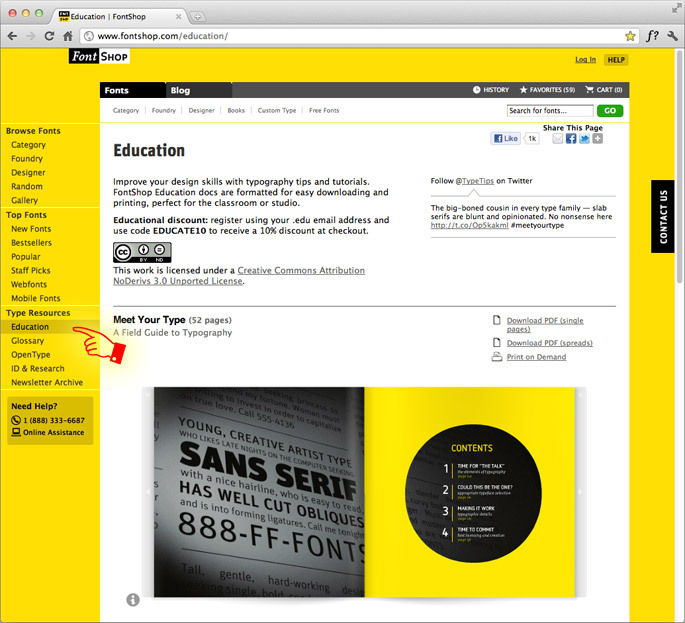 We know we’ve talked a lot about our new FontBook app lately. But we’re not the only ones! Check out our special edition July newsletter for some nice words from around the globe. We also have highlighted a couple of features cross-posted from the FontFeed. What are your favorite parts of the app?